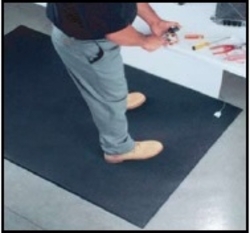 ProTech also manufactures OrthoMats in ESD configuration that gives you ability to drain electrostatic charges and a superb comfort mat in the same product. Call with your layout requirements for size and ground placement. Surface resistivity is 10-5 ohms per sq.